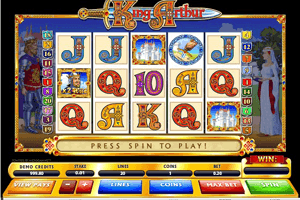 King Arthur is a 20 paylined medieval themed video slot machine that comes to players straight from the rich and the varied gaming portfolio of Microgaming. This is why players can expect to enjoy a one of a kind experience that will take them into the medieval times, the era of kings and their knights. They will also enjoy the company of some of the epic and legendary names in that era such as King Arthur and his Excalibur sword as the game is based around the legends that surrounded that sword. Play King Arthur Slot here. As a result, all of the icons that land on the game’s reels are inspired by that epic time era as they include a king’s crown, the king, Arthur, his Excalibur sword, a queen, a knight, a palace and card icons that come with royal designs to be fitting to the game’s theme. The King is the wild icon as he will use his royal power to replace any other icons on the reels of the game, if the 2X Wild King symbol appears, it will not only substitute for other symbols as it will also double any winnings it creates. The Scatter Excalibur sword is a very special symbol as it pays players in multiplied scattered rewards according to the number of swords that land on the screen of the game, players can find out more at the paytable of the game.